The Victorian Parliament was the scene of a bipartisan message against hatred and antisemitism today as party leaders united to jointly sign The London Declaration on Combating Antisemitism. Daniel Andrews MP (Leader of the Opposition), Bruce Atkinson MLC (President of the Legislative Council), Dr Denis Napthine MP (Premier of Victoria), Ken Smith MP (Speaker of the Legislative Assembly), David Southwick MP (Member for Caulfield). Obscured behind the Premier is Marsha Thomson MP (Member for Footscray). 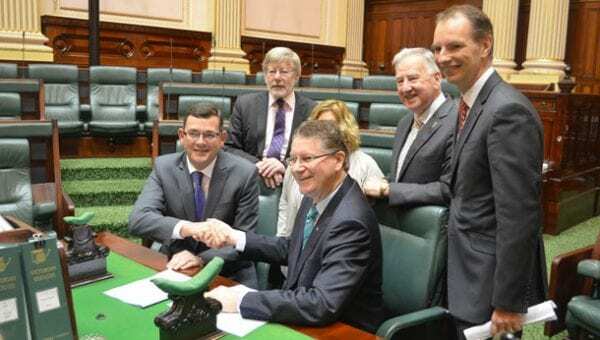 Premier Denis Napthine and Opposition Leader Daniel Andrews shook hands as they sat next to each other and then signed the declaration in a ceremony organised by the Parliament’s Friends of Israel co-chairs, Caulfield MP David Southwick and Footscray MP Marsha Thomson. The Presiding Officers of the Parliament, Speaker Ken Smith and President Bruce Atkinson also added their names to the declaration. More than 60 Coalition MPs signed the declaration in one day, adding their names to a list that includes Prime Minister Julia Gillard, Federal Opposition Leader Tony Abbott and dozens of state and federal MPs across Australia. “There should be no doubt in the minds of all Jewish Victorians that their Parliament joins them in fighting hatred in all of its forms” said Mr Southwick. According to the 2011 Census more than 46% of the Australians who identify as Jewish live in Victoria.